"No matter how many times I came in for my research, there was a new challenge or success or something different that I would see that I hadn't seen before. It's been a really great, fun experience!" "When I was in high school, I was looking for a university that had a Zoology major or something similar, and there were only a few schools that fit that criteria within the tri-state area. I went to look at a couple programs at Miami, and there's really just nothing that compares to the feel here. When you step on campus and look around, everything feels right—Miami feels like home. "My first year at Miami was started with the Honors Program, and I felt well-prepared. I was part of a cluster of about 24 students, and we shared three classes, including Honors 181. The classes were connected in ways that you wouldn't realize. That's where I met a lot of my first friends at Miami, and the Honors Program made choosing and pursuing classes very easy and reachable. Because I didn't have to follow the Miami Plan, I was able to branch out, and it really helped me delve into doing research with the anthropology department. Having that kind of flexibility from the beginning made it work well. "I really enjoy that at Miami you can find great friends both within and outside your department. It's very interesting that once you go to college, you start to specialize in one subject and other people specialize in another. Even though all of us come in with a basic understanding of things, we become experts in our own individual fields. "I also love the fact that Miami has that 'Public Ivy' image—it's a very well-respected institution. You come in and feel like you're a part of something special. It's not just the red bricks and the beautiful trees that make Miami such a wonderful place to learn and spend these four years. It's also about making amazing friends and learning from amazing professors." Dr. Linda Marchant and Mary Kate Findley discuss their research. 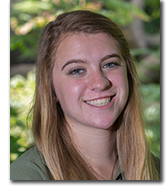 "My favorite experiences in terms of classes have been in biological anthropology, because there are a lot of primatology courses associated in it. These classes really focused on animals, with fossils and hands-on learning. Doing research has been a really eye-opening experience. It's really exciting to be able to formulate my own project, which is what I've done with my research on bonobos at the Cincinnati Zoo. 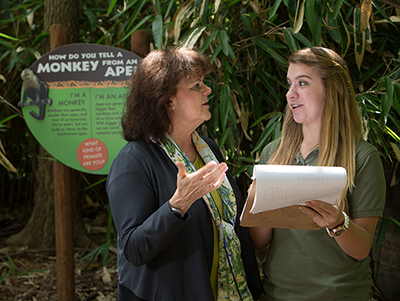 "Dr. David Russell, who teaches zoology, has had a positive impact on my time here. He has such a passion and is so excited to come to class every day and teach. Dr. Scott Suarez and Dr. Linda Marchant, both in anthropology, have also been very passionate about their topics. All of them have a lot of experience in their fields and know exactly what they're talking about. They've been great role models as I got started in a project of my own. "Other great experiences I've had at Miami include going to the hockey games with my friends. We have a lot of team spirit for hockey. I try to go to all the home games, and I've even gone to some away. I've also enjoyed being on the executive board for Phi Sigma Pi, which is a national honor fraternity. It's more a business-like and academic Greek organization than a social one. I went to the national conference this past summer in Atlanta and got to meet people from all over the country from different chapters." "I definitely think there is an advantage to the liberal arts education. Sometimes the majors in the liberal arts can feel underrated, but, in reality, many of these types of careers have really skyrocketed. For example, for the big Ebola outbreak that was scaring a lot of people last year, there were anthropologists on the scene to study the spread of that disease. Zoology has been big with conservation. Those are just the things I'm interested in, and they're very important things to notice. "The thing I love about the liberal arts here at Miami is that your expertise in one thing can offer a whole new perspective somewhere else, including the real world. Having that type of education and being more open to where life takes you and what you can offer is really cool. I've been able to take classes in zoology, anthropology, communication, and other things, all of which have given me really interesting perspectives. In my philosophy course, for example, I was able to bring in biological ideas. Likewise, in one of my communication classes, I brought up some biological anthropology and evolution terms, and it really enabled me to expand my perspectives. I'm very open to see where all of this takes me." 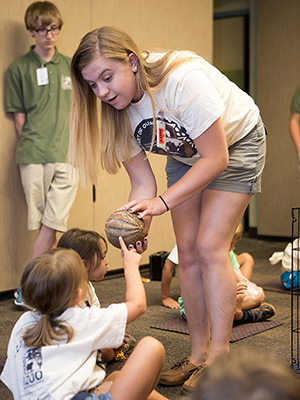 Mary Kate Findley works with some young children at the Cincinnati Zoo. "I have to give credit to my sister for starting me off with my interest in the Cincinnati Zoo, which is pretty close to home. They have this volunteer program there called Volunteen, in which basically kids of ages 13 to 17 can volunteer at the zoo. We submitted our applications, and I volunteered there for 4 years, worked for 3, and am still there today. Being at the zoo for those 7 years really made me passionate about animals and conservation, and that's why I specifically wanted a zoology program rather than just biology. I really wanted to go into something that concentrated on animals! "When I got involved with Linda Marchant's zoological research, I saw an opportunity to focus on bonobos. They and chimpanzees are our closest living relatives. We diverged from them 6.7 million years ago, and then they diverged after that. Although the two species are closely related, they do look a little different. Their social systems are very different, as well as their habitats. "People often describe bonobos as more of the 'make love, not war' type of persona, compared to chimpanzees. They have a very socio-sexual way of staying peaceful. Rather than beating up and chasing each other and having big displays, bonobos usually just get together and eat in peace side-by-side, after showing alternate ways of establishing themselves with others. We often think of chimpanzees as very muscular, hair sticking up, teeth bared. However, I actually had an adult male bonobo display at me. He would take an object, run around, slam it into the glass, and scream and bare his teeth. I'm not going to lie—it was terrifying and I thank God that there was that barrier between us! After that, he would just sit there eating his breakfast and I would drink my coffee and we would just sit there together quietly. "I kept my clipboard and stopwatch with me at all times, and if the bonobos were outside and hard to see, I would have binoculars too. I studied their grooming behaviors, looking for who was grooming who and for how long, where they were grooming each other, and how they were grooming each other. More specifically, I was looking for a very minute action—hair plucking that would occur during grooming, either with the hands or the mouth. This used to be considered abnormal, but now we might just call it unwanted behavior. There has never been hair plucking recorded in the wild, but it has been observed in captivity in bonobos and some gorillas. It could potentially be a sign of stress, or it could just be a sign of how they assert dominance. That was what I was looking for. Another Miami student did a study of hair plucking at the Columbus Zoo, and my study was a comparative of his. The preliminary finding right now is that bonobos have very low frequencies of this behavior at the Cincinnati Zoo. It occurs 8% of the time from all the bonobos, including my highest plucker, whereas at the Columbus Zoo, it occurs in about 21% of the time for every single groomer. We're examining the differences and asking questions such as: 'Is there something in the enclosure that's making them more stressed? '; 'Are they doing this more indoors or more outdoors? '; 'Are they doing this at times where there was high guest activity, or during really hot portions of the day? '; 'Are they doing it when they're pregnant or when there is a newborn in the group?'. It's really hard to determine, but looking at these preliminary findings, it could just be a personality trait, like some people might twirl their hair or talk with their hands. 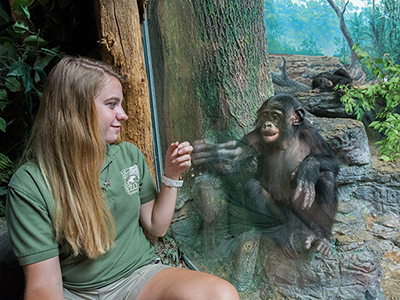 "The Columbus Zoo and the Cincinnati Zoo together account for about 35% total of the captive bonobo population in the U.S., which means that the other Miami student and myself have studied over a third of the bonobos in this country!" "If you're interested in something, remember to commit to it wholeheartedly, see it through, and see all that the avenue has to offer. What I really like about doing research is that it's not all about collecting data. Even undergraduates are doing important things in research. And if you're doing an internship, even though you're just an undergraduate and sometimes you may just be helping, you're actually making a difference. Every day was a new day, and no matter how many times I came in for my research, there was a new challenge or success or something different that I would see that I hadn't seen before. It's been a really great, fun experience!"